When a pathogen enters their colony, ants change their behavior to avoid the outbreak of disease. In this way, they protect the queen, brood and young workers from becoming ill. These results, from a study carried out in collaboration between the groups of Sylvia Cremer at the Institute of Science and Technology Austria (IST Austria) and of Laurent Keller at the University of Lausanne, are published today in the journal Science. High population density, as well as frequent and close contacts between individuals, contribute to a rapid spread of diseases. To protect their colonies, ants have developed disease defense mechanisms, including adaptations to their social organization. Ants do not interact randomly with other colony members, but are organized in sub-groups according to their age and the tasks they carry out. While young worker ants, so-called "nurses," look after the valuable brood at the center of the colony, older worker ants become foragers that collect food outside the nest. These forager ants are more exposed to pathogens. 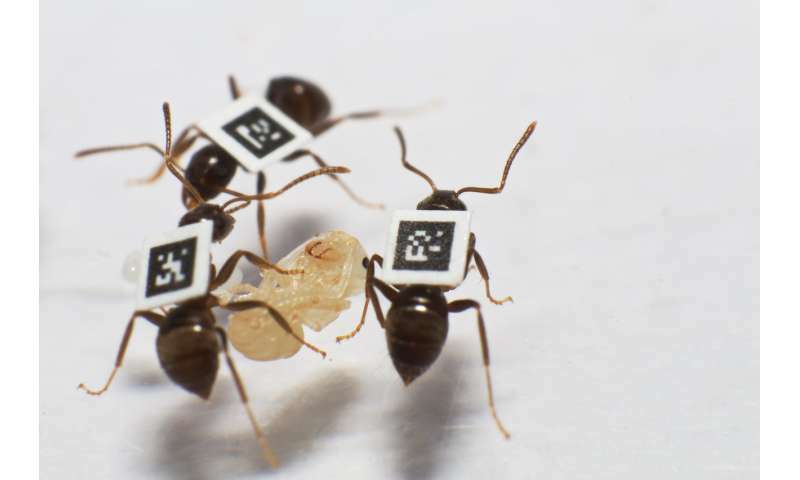 The researchers used a "barcode" system developed in the Keller group to follow the interactions between ants, especially to observe their behavior when disease spreads. 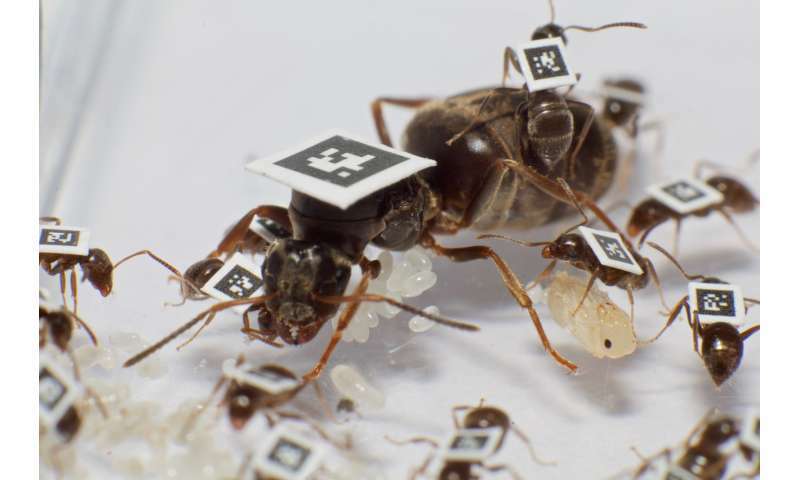 In a first experiment, they placed digital markers on 2,266 garden ants. 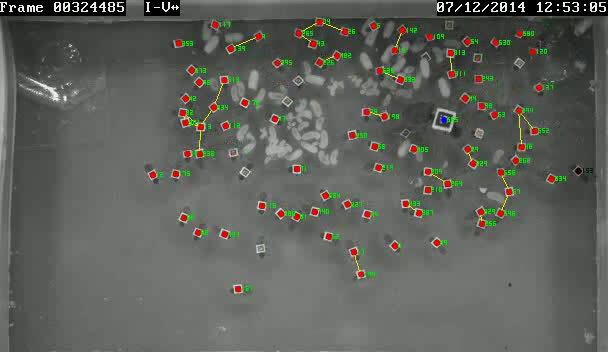 Infrared cameras took an image of the colonies every half second, and so the researchers could follow and measure the movement and position of each individual, and their social interactions. The researchers showed that the ants' subdivision into groups acts prophylactically and reduces the risk that disease spreads. 10 percent of the worker ants (all foragers) were then exposed to fungal spores which spread easily through contact. Comparing the ant colonies before and after pathogen exposure showed that the ants quickly detect the presence of the fungal spores and change their behavior to strengthen already existing defenses. "The ants change how they interact and who they interact with," explains Sylvia Cremer, "The cliques among ants become even stronger, and contact between cliques is reduced. Foragers interact more with foragers, and nurses more with nurses. This is a response by the whole colony—also animals who are not themselves treated with spores change their behavior." Laurent Keller adds: "This is the first scientific study that shows that an animal society is able to actively change its organization to reduce the spread of disease." Using a highly sensitive qPCR method established in the Cremer group, the researchers could quantify exactly how many spores an individual ant carried on its body. qPCR monitors how a targeted DNA molecule is amplified during the so-called polymerase chain reaction. This allows researchers to draw conclusion about how much of the DNA, and by inference how much of the fungal spores, were present in the beginning. Because the ants changed how they interact, spores transfer patterns also changed. Only few individuals received a high pathogen dose, which could cause disease. In addition, more ants received a low dose, which Cremer and her group previously showed to not cause disease but instead be protective in the face of future infections—similar to variolation in humans. "The pathogen is distributed on many shoulders, and the ants' immune systems can deal very well with this lower pathogen level, which provides a form of immune memory," says Cremer. The analyses also showed that the colony protects especially valuable animals. The queen, the only individual that reproduces, and the nurses, young worker ants that can still contribute many hours of work to the colony, received less of the pathogen. "In a colony, not all animals have to be protected—but the most valuable individuals should survive," Keller explains. The researchers also carried out a survival experiment, to see how pathogen load 24 hours after exposure correlates with death from disease. The correlation was high, says Nathalie Stroeymeyt, first author and Postdoc in the group of Laurent Keller: "We calculated a predictive spore load for each individual ant, based on its interaction with other ants in the first 24 hours after pathogen exposure. Ants with a high predicted spore load were more likely to die nine days after exposure than ants with a low predicted spore load." She summarizes: "Mortality was higher among foragers than among nurses. And all the queens were still alive at the end of the experiment." How ants collectively deal with problems, such as the risk of an epidemic, could give insights into general principles of disease dynamics, says Cremer: "Social interactions are the routes on which diseases travel and define how epidemics may spread. Basic research on ants can help us to deeper understand epidemiological processes, which can be relevant also in other social groups."